This week my husband and I combined our facebook accounts. He's been asking me for over a year, "why don't we just get one facebook account? We get on each others pages all the time anyway". And he was extremely right. We both get on each others facebook accounts all of the time simply because we're nosy. But, the people we're nosy about aren't people we necessarily want to be friends with. 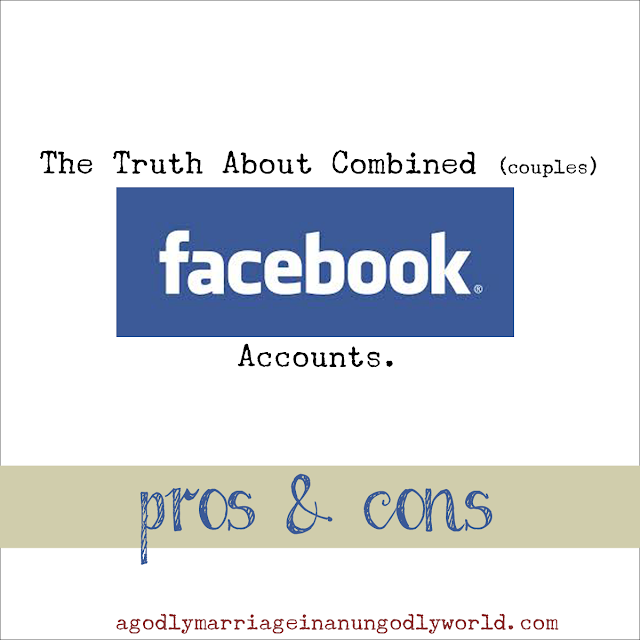 When he first mentioned combining accounts, I actually put a status on my facebook account asking what others thought about combined facebook accounts. The reaction I received was far from pleasant. Many of the responses were "oh, that annoys me, how much more insecure could you get?!" Or, "how inappropriate -- so you mean if I want to be your friend I have to be your husbands friend too?" Um, how offensive! There were, of course, the very few who thought it was an amazing idea and it encouraged them to combine facebook accounts. While it might be true that some wives or husbands might make their spouse join facebook accounts with them because of insecurity, I have found that it is a completely false assumption. Over the past few months, I've taken notice of some of the people on the A Godly Marriage facebook page and other Christian pages, and have found them to be more inspiring than anything else. 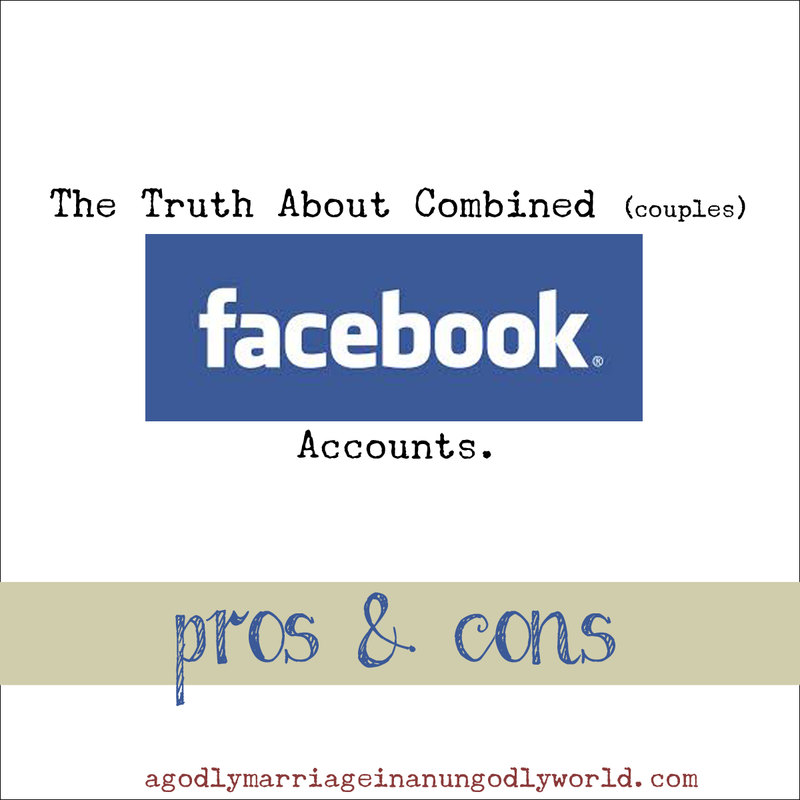 So, I've decided to put together a list of pro's and con's when it comes to creating a new combined facebook account for you and your spouse. I think you might find that it is a lot easier and more fun than you may think. And if nothing else, I hope it stops the stereotyping of Christian couples with joint accounts. It holds me accountable to what I post and reply to. This was the very main reason I finally decided to take the next step into joining facebook accounts with my husband. While I had gotten a lot better with the things I do and say on my personal facebook page, there are always going to be people who take things personally or try to turn your life into something negative. It was always easy for me to post something out of anger or to even respond to something in a loving way, but have it taken the wrong way. While this is something that happens to everyone, I still wanted to find a way to make myself think longer and harder about what I do or don't say or do. Now that we have a combined account, it's so easy for me to think about saying something, but then decide not to say it. Why? Because even if there is an ounce of possibility that it could go south, not only does it damage my character, but it also damages my husbands character. Which makes me think of this scripture, "A wife of noble character who can find? She is worth far more than rubies. Her husband has full confidence in her and lacks nothing of value. She brings him good, not harm, all the days of her life." Proverbs 31:10-12 NIV. Further in chapter 31 it says that her husband is respected at the city gate, and I have to think to myself, "If I respond or post in a certain way, will it bring honor to my husbands name? And most of all, will it be in accordance to the word of the Lord?" I think about my husband, all. of. the. time. I'm not sure how much more I could have thought about him than I previously did, but I do. I think about where he is, what he's doing. It even reminds me to stop and pray for him every time I log in. I get to see the things that interest him by the things that he "likes". While this mainly includes camo, beards, hunting, and funny meme's, I've found that it also includes a countdown to Christmas...score! These "likes" might come in handy for Christmas and birthdays! It shows that we are one and rids us of any temptations that might come our way from the internet. While neither of us currently deal with internet temptations, it is something that can come from out of no where. And while my husband and I would never be disloyal to one another, having a combined name certainly deters people from snooping and sending you an inappropriate private message ;). Insecurity? Absolutely not. This reason wasn't even something we thought about when we joined accounts. But it definitely is a pro! I automatically spend less time on facebook. It's true. I don't know why. I just don't spend a lot of time on there anymore. I guess it's simply because it is easier for me not to scroll through my newsfeed and post 100 quotes in a day. What a waste of time that was. Instead, I now post them on my facebook fan page, such as A Godly Marriage in an Ungodly World and Boogers and Jesus. While I was sharing so many of these things on my personal page, I neglected to post them on my fan pages as well....where they were most needed! Having a combined account encourages me to spend more time blogging and helping rather than focusing on my own troubles and drama. It has also forced me to spend more time talking on the phone, through email, or through text. Which helps me with one of my goals, spending less time on facebook! It's time consuming. I spent over 2 hours this week trying to figure out who I wanted to keep on my friends list. Because I naturally do not want to hurt anyone's feelings or make them think I intentionally deleted them, I put out two facebook blasts telling people that I was deactivating my account, and where they could find me. Then I took the time to individually invite people to be my friend on our combined account -- people that were important to me. He already had all of his friends on his page. THEN, I had to transfer ownership of 5 fan pages to our new account! And the fear that I might not do that properly was just mind boggling. We get notifications on our phones at the same time. So, if I'm messaging someone on facebook, it automatically notify's him on his phone. Lovely. While he's at work, his hip is ringing the entire time. This is probably another reason for the pro "I automatically spend less time on facebook". But, on the bright side, he can choose not to receive push notifications on his iphone for messages. Done and done! People get weird about combined facebook accounts. 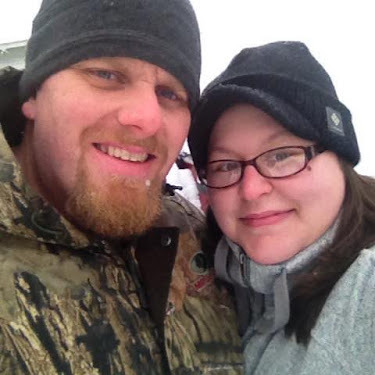 People automatically think you're goofy for having a facebook account with your spouse. I'm not sure why, but quite honestly it is silly. After all, I married this person. I'm sharing my entire life with them -- why not a measly facebook account? So far, I'm really enjoying a combined facebook account with my husband. My most favorite part of it all is that I feel closer to him. Weird, I know. But I do. I feel like this is just one more step in our marriage that brings us closer together. We are who we are. We go everywhere and do everything together. Not because we have to, but because we want to. He is my very best friend, my strong shoulder to lean on, and the arms that hold me every night. Why wouldn't I want to share this small part of my world with him? Some people ask, "don't you feel like you're giving up part of your freedom?" No way! I feel so much more free now than I ever have when it comes to social media. I don't have to worry about what I do or don't do every five minutes. I don't have to worry about accidentally giving off a false image of myself to others. Why? Because what they now see is "us". And I am so much more proud of "us" than I am of myself as an individual. This doesn't mean that a combined account is for everyone, not at all. But if you've been thinking about it, talk to your spouse! If they give you some kick back, move on and bring it up again a few months later. "Facebook and other social media sites are more dangerous than necessary -- they ruin more relationships than anything else in our country." source please, lest you bear false witness. How exactly did you go about combining your Facebook accounts? I would like to do the same. Thank you. This was very helpful. It has given me hope in many things at the moment. I pray my husband will agree to share his fb life with me. I dont care to lose 600 friends i dont talk to and are products of my past.